The drive that runs through Prospect Park, where bicyclists and pedestrians have had a series of collisions. Under proposed changes, each group of users would have its own travel lane. A set of proposed changes to the Prospect Park loop in Brooklyn would radically change its current design, reducing the space for cars to a single lane and creating two separate, dedicated lanes: one for pedestrians and one for bicycles. The changes, to be unveiled on Tuesday, came in response to a series of collisions between pedestrians and cyclists, and amid growing rancor over how to balance the interests of the 10 million people who crowd into Prospect Park each year. The debate intensified last fall after a pair of severe accidents left two women with brain injuries. “We decided that the only workable solution was for each group to have a lane and only one lane, throughout the day,” said Emily Lloyd, the Prospect Park administrator and the leader of thetask force of city agencies and park users that developed the proposal. She said the goal of the Prospect Park Road Sharing Task Force had been to increase safety by making the drive, which is 3.3 miles long, more predictable and easier for pedestrians to cross. “There was consensus — I would say enthusiastic consensus,” Ms. Lloyd said. Under the proposal, the center lane, which is now used by motorists during morning and evening rush hours and by bicyclists at other times, would be for bicycles all day. (Car traffic is allowed from 7 a.m. to 9 a.m. on the East Drive, and from 5 p.m. to 7 p.m. on the West Drive.) The left lane, which is currently divided between pedestrians and bicyclists during the rush hours, would be for pedestrians. And the right lane would be the only place for vehicular traffic: individual drivers when the park is open to cars, and parks department and other working vehicles in the off hours. Ms. Lloyd anticipates a harsh reaction from drivers when the proposal is announced at the Tuesday meeting, especially from those who chafed at losing a lane of traffic when a bike lane was added to Prospect Park West two summers ago. But she urged drivers not to rush to judgment. The Transportation Department has said it expected the task force recommendations to be put into effect this spring. The task force, with 14 members, included community groups, cyclists and pedestrian advocates as well as the New York Police Department and Transportation Department, which provided models to assess the effects on traffic in and around the park. Drivers were not officially represented. “Because we did not see this as an issue of cars in the park, we did not have a specific group representing cars,” Ms. Lloyd said, adding that local politicians with representatives on the task force, including Marty Markowitz, the Brooklyn borough president, and Brad Lander, a member of the City Council, had stood up for the interests of all their constituents, including car owners. Mr. Lander said in an e-mail on Monday that he supported the task force’s recommendations, but Mr. Markowitz was more measured in his assessment, noting that car traffic could be displaced onto neighboring streets. The lanes would become narrower for cars and bikes, with the right lane adding a three-foot shoulder, leaving 10 feet for driving, down from 12 feet. 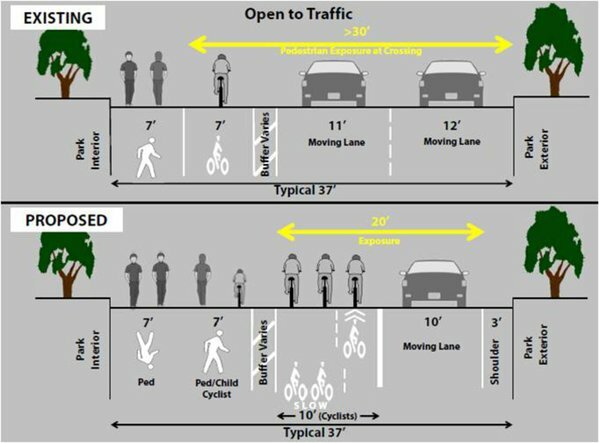 The center lane would go from 11 feet to 10 feet and include separate painted bike lanes for children and fast riders. The pedestrian lane would remain 14 feet wide. At the meeting on Tuesday, Ms. Lloyd said, she would present a study that modeled the effect of reducing the number of car lanes on traffic in the park during the morning and evening rush. Roughly 700 cars currently use the park drive each hour in the morning, creating what the task force calls “free-flow operations” of the kind that occurs “frequently in rural areas, and generally in car advertisements.” By pushing that traffic into one lane, the study found there would be about a six- or seven-second delay added to the trip through the park. During the evening commute, use of the park drive is much lower (about 250 cars per hour) and the delay would be about a second, according to models by the Department of Transportation, Ms. Lloyd said. In the past months, the police have stepped up enforcement on the loop, ticketing cyclists for running red lights or riding the wrong way on the park drive. During a period from late November, after the task force held its last public hearing, until mid-December, park officers and the police issued 102 tickets to cyclists for running red lights, and 49 tickets for going the wrong way. A version of this article appeared in print on February 28, 2012, on page A21 of the New York edition with the headline: Proposal Would Separate Drivers, Cyclists and Walkers on the Prospect Park Loop.